ACLs can be used to filter advertised and received routes of various dynamic routing protocols. For example, enterprise users access the Internet using a switch. Some users, such as R&D staff members, need to be prohibited from accessing the Internet and some servers such as salary query servers reject external access to ensure information security. 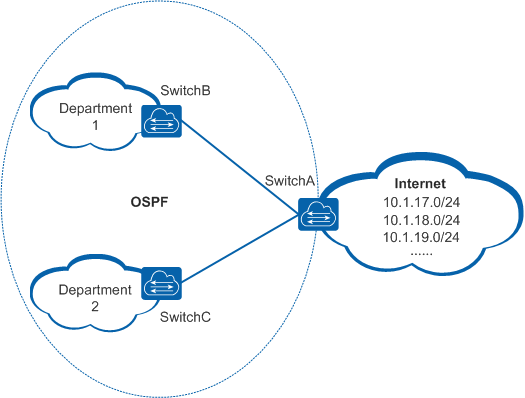 To meet the preceding requirements, define the ACL rules on the switch connected to the Internet to filter certain packets. 1. SwitchA only advertises routes 10.1.17.0/24, 10.1.18.0/24 and 10.1.19.0/24 to SwitchB. 2. SwitchC only receives the route 10.1.18.0/24.